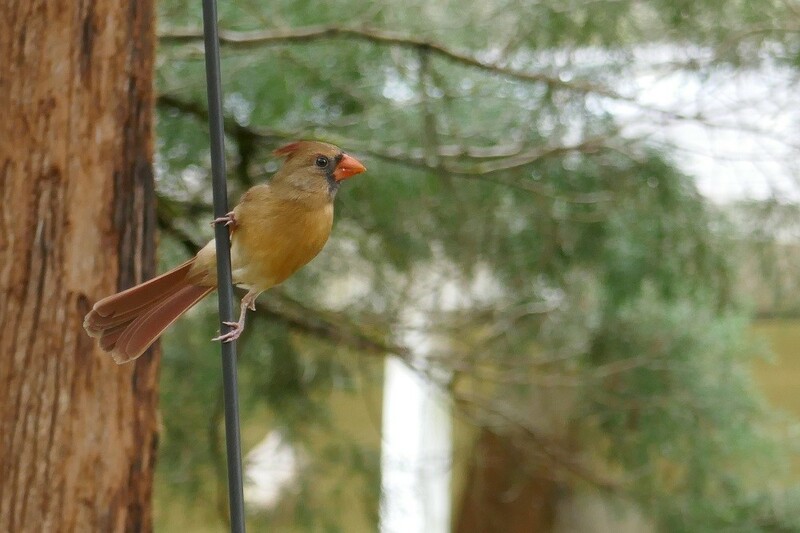 Northern cardinals are a familiar site at many of our backyard bird feeders. However, their natural habitats are woodlands, dense thickets and swampy areas. 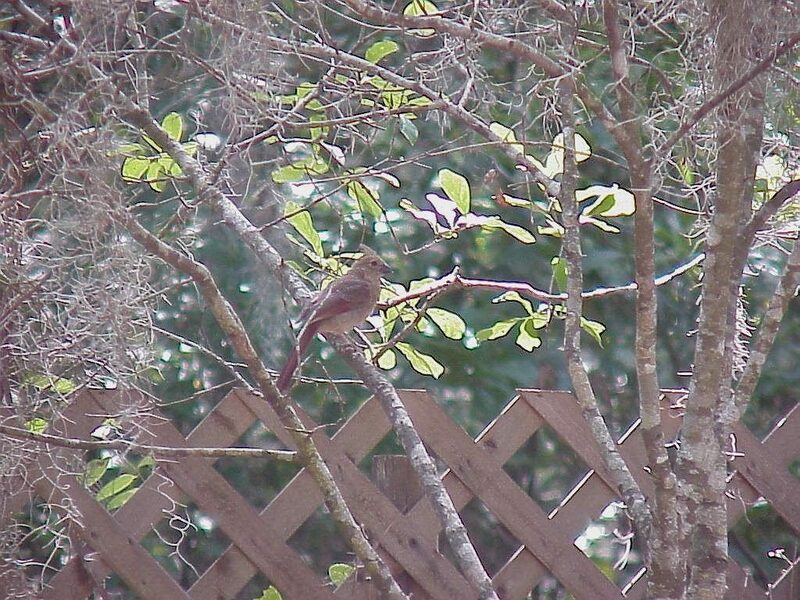 Cardinals are members of the Cardinalidae or cardinal family. The cardinal’s diet consists of approximately 35% percent insects and 65% percent vegetable matter. They forage on the ground, in thickets, under upper and lower tree canopies, and underneath shrubbery. They generally stay as concealed as possible, while feeding, so as to avoid predators such as sharp shinned hawks. They consume many insect pests including moths, cutworms, grasshoppers, aphids, snails, and slugs. A great variety of weed seeds are also consumed as well as leaf and flower buds. Cardinals are also very fond of wild fruits such as hackberries, dogwoods, hollies, mulberries, elderberries, sumac, and viburnums. The preferred foods for cardinals at bird feeders are sunflower seed, safflower seed, and white millet. Courtship begins in late winter. During the fall and early winter the male generally acts indifferent towards the female, and may act aggressively towards her when he comes into contact with her while foraging. However, at the beginning of the courtship season they can be seen peacefully foraging together. During this time the male can also be seen feeding the female bits of food. This behavior is known as mate-feeding. Mate-feeding is a large part of the cardinal’s courtship. Courtship also triggers another behavior known as counter singing. This is when the male and the female sing to each other from different perches within their territory. When counter singing the male and the female match and repeat phrases and songs. Among courtship behavior mate-feeding and counter singing are the two of the most frequently observed. 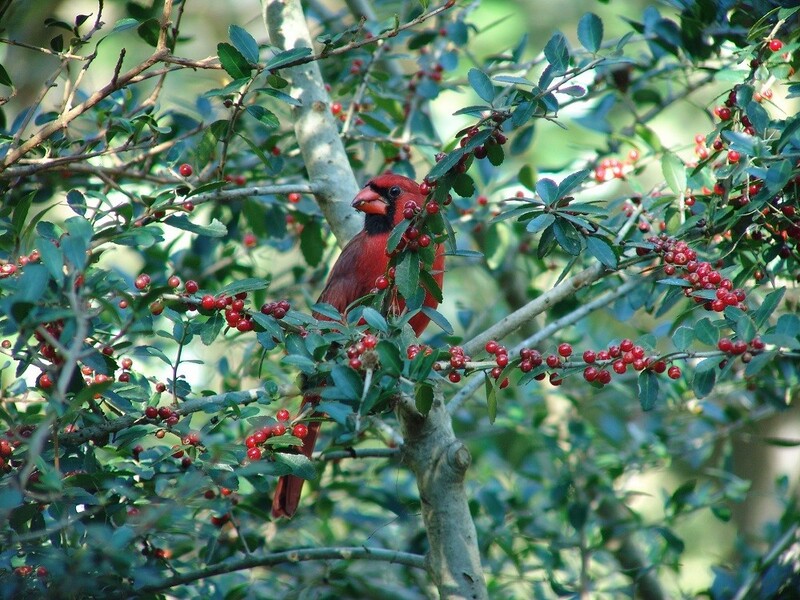 Breeding cardinals are particularly attracted to dense thickets of brambles, dense shrubbery, dense vines, or closely spaced saplings for their nest building and placement. The female gathers the nest material and constructs it. The male contributes by bringing food to her while she works, and may occasionally bring nesting material. During construction the male remains by her side, or nearby singing to her. Construction of the nest begins in late March or early April. 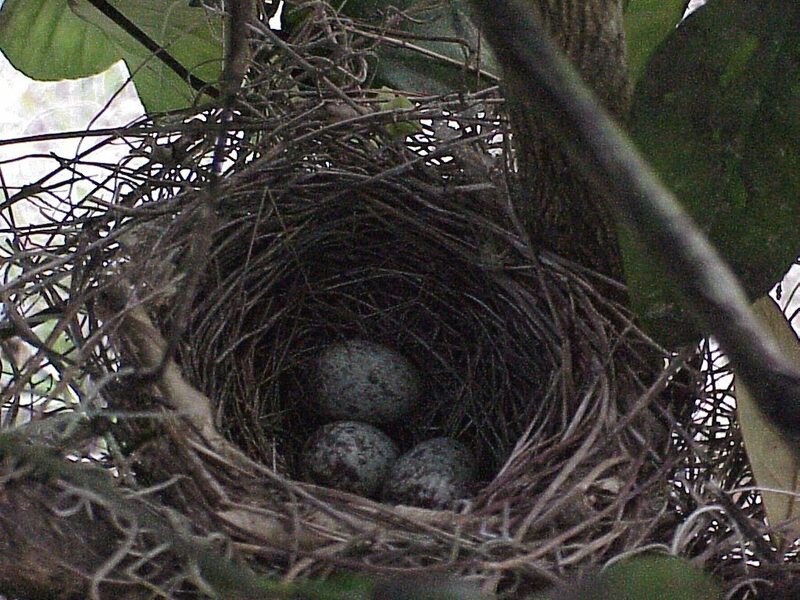 The nests are cup shaped and consist of stems, twigs, leaves, paper, bark, grass, and grass rootlets. The nest can be found from 3 to 10 feet above the ground, but the average height is 5 feet. The clutch usually consists of 2 to 5 grayish or bluish to greenish white, spotted or blotchy eggs. The female incubates the eggs for 13 days, during which time the male brings her food. However, she may leave and feed herself periodically. She broods the newly hatched young constantly for the first five days, during which time the male brings food to her and the nestlings. After the first five days both parents bring food to the nestlings. The nestlings are raised entirely on insects. The young leave the nest (fledge) at approximately 10 days. The fledgling phase lasts 3 to 4 weeks. The female may leave them in the care of the male while she attends to a second brood. Up to four broods may occur in one season. If a bird feeder is nearby the male will take the fledglings to it and feed them. Juveniles are distinguished from the adults by their dark gray beak and mottled plumage.